August 14, 2013. We got the following email from Bob Chase, a former owner. Thank you for all the work you do documenting the history and present lives of the Dolphin 24. I suspect it is a labor of love, and as the former owner of hull 202 (Aurora) I know the power such a boat can have over one. After more than 25 years I would like to reconnect with Paul Malm in hopes of seeing Aurora, and as many of the fleet of Dolphins in port at Wilmette, Il. By the way, in 1978, my wife and I bought Aurora from Wayne Bell who kept the boat at Sand Pointe, Michigan on Lake Huron. She was named Damn Yankee. I don't know the original owner. We had the boat from 1978-1986 and kept it at the Wesley Marine (formerly Barteau Boat works) docks on White Lake between Muskegon and Ludington, Michigan. 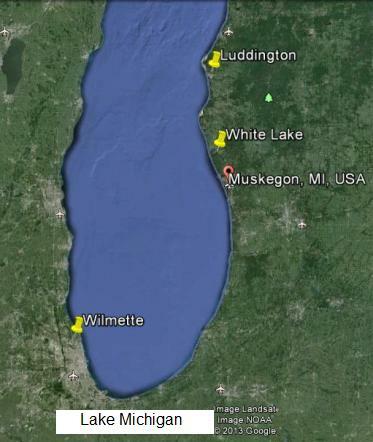 We did mostly weekend sailing, but tried to spend at least a week or two crusing the eastern shore of Lake Michigan. I will send photos separately.